Take a hundred steps backwards and your feet are in the sand! Full Bedroom with spacious closet. Twin Bedroom with spacious closet. Bathroom with shower and plenty of storage. Back view of cottage with new deck and stairs to parking area. Mayo Beach is across the street and Sandcastle Heaven! Bookstore Restaurant three doors away from cottage! Baker Field Playground is just steps away! 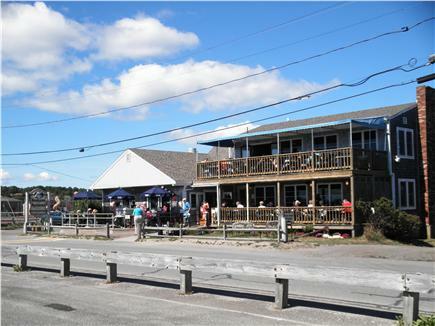 Cottage to the right, Ceraldi Restaurant to the left..THAT CLOSE! Walk into the the center of Town and enjoy quaint shops! While we've not yet counted the steps to the beach, we're guessing it's around 100! More if you have kids with you and less if you're on a mission for as much sun, sand and water as you can get! This cottage is truly the perfect getaway location for families! When you pull in the front drive and get out of your car, just take a moment to turn around and take in the vast view! You've arrived at Wellfleet Cape Coddage and Mayo Beach! Personally, it's our favorite beach on Cape Cod. When you enter this cottage, you’ll immediately see beautiful knotty-pine walls and gorgeous hard-wood floors! Notice the side table that you may use to drop your keys, a shoe tray to help keep the sand from the beach across the street a little more confined and several coat hooks with shopping bags for your use. The ample dining table greets you with lots of information on the cottage and the Cape plus a Guest Book, along with another side table used to house the coffee station and shelves you may need to use to hold stash for your stay. The back deck offers a charcoal grill, clothes line and plenty of ‘hanging out’ space. Although the kitchen is small, it does sport a new range and refrigerator along with plenty of dishes, silverware, serving pieces, blender, mixer, microwave, lobster pot, etc. In the living room, you’ll find a storage piece holding some miscellaneous kitchen items, another large picture window to view the harbor and to watch the sunsets, a loveseat and two chairs, books for your reading pleasure, a flat-screen TV with cable, and hi-speed internet. (There is also a fireplace - for ambiance only at this time.) The bathroom has a shower and plenty of storage for your personal items. The master bedroom holds a full bed with storage underneath, a large dresser and a closet. The second bedroom has two twin beds, large dresser and closet with hangers and an ironing board. In the basement you’ll find a brand new heating system – which will keep you nice and toasty if you happen to visit during the off season. (The cottage does not have air conditioning as the harbor breeze keeps it nice and cool.) You’ll also see a brand new washer and dryer for your use! There is parking for one car in the front and a second may be parked around the back of the house. And, yes, you’ll park in the grass. Across the street you’ll find access to the beach at the Town Landing to the left of the basketball court. Down the street to your left is the harbor and pier, while to the right of the cottage are a playground and tennis courts. There are three great restaurants within a 2-minute walk from the cottage, along with a fresh fish market on the pier and a great little outdoor place to pick up some tasty treats! Wellfleet Town Center is a 15-minute stroll or a 5-minute bike ride. The cottage is located roughly 5-10 minutes from several ocean beaches, 25 minutes to Provincetown, and 20 minutes to Orleans. There are plenty of walk/bike trails nearby, and lighthouses and many historical sites within 20 minutes, also. Note that linens and cleaning are not included in the rental amount but may be added to your stay if you do not want to leave the cottage clean or want to pack your own linens. Additional pricing info: Required Cleaning Fee $100 per week; Optional Linen Fees $100 per week, State and local taxes of 12.45% will apply. There is a wheelchair accessible ramp into the front of the cottage and a large back deck. All amenities (except laundry) are located on the main floor of this one-story cottage. Highly recommend Wellfleet Cape Coddage!!! Location is great! The 4 of us had a wonderful time! Thank you so very much for your wonderful review! Hot and Sunny – perfect weather for a week in Wellfleet! My dad ate 100 oysters and we went to the beach every day. We went to all of our favorite restaurants. We also rode our bikes 12 miles on the Cape Cod Rail Trail. It was one of my favorite weeks ever! The cottage is very cozy! Me and my mom went to Great Island and had a blast! We tubed in the nice warm water! It was the best! Cape Cod is my favorite place to be. Dad, Mom and me all enjoyed it very much. We can’t wait to come back next year!! Our July week turned out to be amazing week of sunny and hot weather. Loved the cottage! It was so clean and had everything we needed – especially the washer and dryer! We spent the week Beaching It – which was a given with Mayo Beach just across the street. One day brought a trip to Wellfleet Drive-In to watch The Secret Life of Pets while others included games with the family, visitors and dinner with friends. Our vacation ended up being great and we look forward to coming back next year. Perfectly appointed. Excellent location! Will definitely return. Our family of 4 rented the Wellfleet "Cape Coddage" for almost a week in June of 2016. Attempting a beach vacation with a 3 and 1-year-old was risky, but the location of this cottage could not have been more ideal for us. Positioned directly across the street from Mayo Beach, and a stone's throw from the town playground and athletic courts, we had endless options for entertainment, all within walking distance... not to mention, we could easily divide and conquer when it came to nap time. The kids loved discovering treasures and creatures in the bay at low tide, and watching the fishing boats come in and out of the harbor at high tide. The water was always calm in the bay, and we were comfortably wading in June...don't forget your water shoes, though! On the days that weren't ideal for the beach, we were able to easily wander into town to shop and explore. We decided to drive up to Provincetown one afternoon and it only took about 20 minutes. The Beachcomber was also another fun lunchtime excursion & allowed us to explore the ocean-side beaches. Pam, the owner of the house, was such a pleasure to work with throughout the rental process. Incredibly kind and accommodating...she even allowed us to extend our stay a few days when our travel/work plans changed. She is very familiar with the area, and has great recommendations. There is a helpful binder at the house that has a ton of local information, as well. Thank you so much for the lovely and complete review! It helps us to hear about the cottage from a family with little children as ours are all grown now! Your detailed description of your stay helps confirm in our minds what we will do when *cough* grandchildren *cough* arrive - in the distant future. We are so very happy that the cottage worked out so well for your family and we look forward to having you return. And thank you for the suggestion regarding the chimney starter for the grill! That is on our list to find before the start of the 2017 summer season. Happy Holiday to your family! This cottage is centrally located in the heart of Wellfleet (by the harbor) with the beach right across the street, restaurants a few houses down and a beautiful walk into town. The cottage is bright and well kept. The cottage also has a beautiful large back deck that has a great view of the sunset (if the weather cooperates). We had a wonderful time and Pam could not have been lovelier. It's the perfect Wellfleet beach getaway. We spent three days and nights at Wellfleet Cape Coddage during the Memorial Day weekend. This was a celebration, as our daughter graduated from college in Boston. We're from California. The place is as advertised, and there is nothing negative to say. 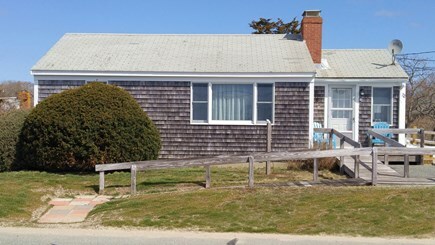 Two bedrooms, full kitchen, laundry, bikes, beach chairs, across a two lane road from the beach looking south from the village of Wellfleet. As a family of four with 2 avid readers and 2 guys that like to be busy, we found the cottage the perfect spot for all of us. A chair on the porch was a great place to read my book and catch the early spring sunshine. Also easy to keep an eye on the kids as they shot hoops right across the street. We are lucky enough to have a truck, so we brought along our bikes - we rode them around Wellfleet and then took them to the bike trail for a 16-mile ride! We found this to be a central location to make our day trips to Provincetown, visit various lighthouses and a museum or two. Each night we returned to the cottage which is like a cozy home away from home to rest up for our next day of fun!! Thank you so much for this 'active' review! We're so glad to hear that it met your family's needs in various ways. We, too, find the location to be perfect for 'day' trips whether it's Hyannis, Chatham or P. town. And there is no shortage of places to hike, bike, swim and eat, either. We look forward to sharing the new outdoor space with you. While being NY Upstater's for all of our collective adult lives, my husband and I both have the 'dreaded' travel bug disease! In addition to be Wellfleet vacationers for too many years to count, we LOVE to travel the US and the world to find those special places that speak to us through natural beauty, food, local history, its people and what it has to offer for fun. We truly enjoy sharing our 'finds' with fellow Travel Bug sufferers! Less than two years ago, we finally 'got serious' about wanting to own a piece of the Cape - preferably in Wellfleet - when we retired at least five years in the future. So, we asked around for a reputable real estate agent. She was a true gem of a find and 'heard' what we wanted to be able to do better than we said it! On a Wednesday in early June 2015, she contacted us about this little cottage and after a brief discussion that same Wednesday evening and another on Thursday, we decided to head down to the Cape Saturday morning. We spent that Friday calling all the individuals who would be involved with the purchase IF we found to be 'the right place at the right time at that right price'. And we're SO glad we weren't SO excited that we skipped this important step! Sunday morning brought another physical visit to the cottage to make sure we weren't overlooking something - which we weren't. Because we had 'run the numbers' and lined everything up before driving to the Cape, we decided to jump on the opportunity. And as they say...the rest is history...or at least we're writing its history! Which allows us to bring this quaint, light & airy cottage to others to share! We hope you find it as special as we do! This gem is actually a dream come true as while we felt that we could purchase a Cape home...NEVER did we feel that a beach home was possible in our future! 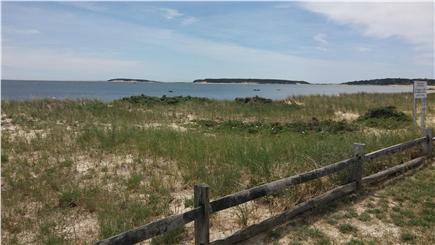 Wellfleet Cape Coddage is a .1 mile stroll across the street from Mayo Beach. 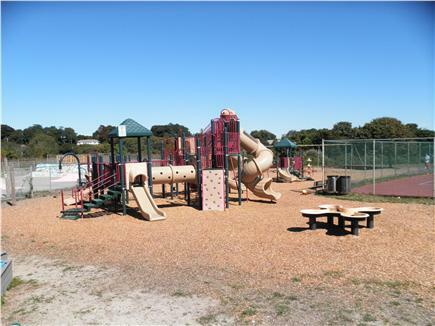 As seen in the listing, it is located in the perfect Park & Play location! Sun and Sand and Water...OH MY! Besides being so close to a quiet, harbor-side beach, this little cottage is well equipped with a large picture window that affords views of the harbor, bay and sunsets; hardwood floors, new carpet and appliances, knotty pine walls, a large deck on the back for those early morning sun rises! It is also wheelchair accessible with a boardwalk ramp and offers a washer/dryer in the basement accessed from the outside of the home. The 'work' it took to bring it to market was such a fun process and we are confident that you will see and feel the love and commitment we have to our little place by the water! We'd love to have you share this beautiful cottage and can't wait to find a way to make that happen for you, your family and friends! This is a wonderful place to Keep Calm and Beach On!